During the long trip in 2005 we also visited Nepal. For once not the mountainous area but the less-known region in the south near the Indian border. 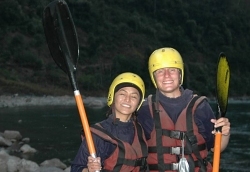 We start in Kathmandu and enjoy the interesting culture and scenery of the surrounding hills. 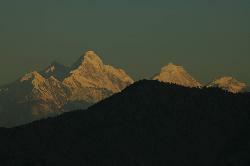 Rice is growing on steep terraces, the Himalayan peaks rise above the forested ridges. Little reminds of us of the busy and loud Kathmandu city. After some days in the capital we take a small plane and fly to Pokhara, a quiet tourist town in Western Nepal. Usually it's a hub for trekkers, but late season and times of unrest (Maoist insurgency is still in full swing in 2005) have had its impact: It is almost deserted, only few tourists relax on the shore of the Phewa lake. Sunsets and sunrises in the warm tropical temperatures of Pokhara make it hard to believe it's almost Christmas time and we are in Nepal. ... the next day we start on the Seti, a relatively warm river with rapids to make for adventurous but safe ride for beginners. Everything is packed in the boats (and yes, there isn't much space, so besides the clothes we were we basically packed a sleeping bag and the boat was full already). So we're on the river, flip a few times, hang upside down in the boats underwater, struggle to wriggle out of it and swim to a nearby shore. On gentle parts we lean back, relax and watch monkeys and birds as we float through gorges and dense jungle. In the afternoons we take out the boats near small villages, look for a house to stay and after a hearty village-style meal we fall asleep on matresses of bamboo on wooden planks (no beds available). On Christmas, we share the room with goats and chicken. After three days we've reached the road where we take out the boats, say good-bye to our great river guides Mahindra and Laxman, and catch a local bus to take us south to Chitwan. After the fun but sparse life on the river, we are ready for luxury. 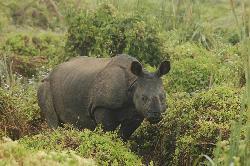 We stay inside the Chitwan National park for three days at a five-star lodge. After crossing the wide Narayani stream we find ourselves in jungle and dense forests until a comfortable lodge appears in the middle of nowhere. The next two days are spent on elephant's back; rummaging through undergrowth on the look-out for animals. We are not disappointed and see rhinos, monkeys, crocodiles and deer, and endless birds in all sizes and colours. The Tiger, king of the jungle, stays elusive, but after seeing the huge prints of tiger's paws near the river and hearing that he recently devoured 3 people (including the wive of one of our elephant drivers), maybe missing him was a good thing after all. Back in Kathmandu to celebrate New Year, enjoying the luxuries of Thamel. We return to Kathmandu and fly to Delhi in the beginning of January 2006; and from there back home to Switzerland. Laxman and Mahindra for being great guides on the kayak trip.